Rigaud d’Aureille (circa 1450-1517), Baron of Villeneuve, was an important figure who enjoyed immense privilege. He was sovereign master of the hotel of the king, was a trusted confidant of the royal family, and was assigned diplomatic missions. The property, which he commissioned on a separate site from the former family manor house where he was born, is an imposing quadrilateral structure flanked by vast towers and encircled by deep moats. The lord also commissioned paintings of himself to adorn the walls, featuring small texts on morality or satire. 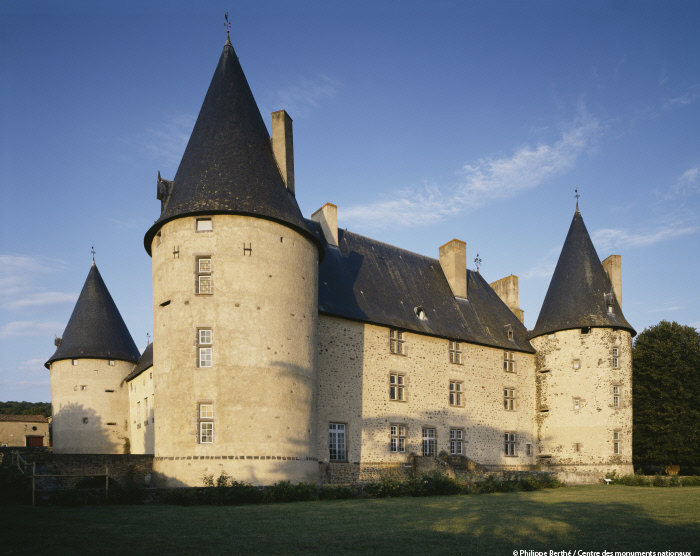 In the early 16th century the Villeneuve estate, which was now a Barony, passed to the Montmorin family. Gaspard de Montmorin embellished the château with sumptuous painted décor, some examples of which can still be seen today in the formal hall and large stables. In 1643, Villeneuve-Lembron was acquired by Isaac Dufour, Treasurer of France, who transformed the interior courtyard, created a portico gallery, and decorated the ceilings and fireplaces on the first floor. His descendants, who remained owners of the château until the end of the 18th century, subsequently passed it on to Pélissier de Féligonde, who retained it until 1919. The Château was listed as a Historic Monument on May 25th, 1926. The last owner, Georges Tixier, left it to the French state in 1937. The state then began restoration work on the property. It is currently managed by the Centre des monuments nationaux.